I love maps at any time, and this atlas is full of amazing maps! It’s got pictures and factoids and terrain and history, all with colorful lines and photos and interesting little details. The first thing I did was turn to the page for my state, Georgia, and poured over the pages, finding my town, and looking for nearby national parks and monuments. I like how the book is divided up by region- SouthEast, SouthWest, NorthEast, MidWest, etc… It makes it easy to find what you are looking for, and to see how states that border each other have a lot in common. This book does a great job of packing a lot of information into each page without losing clarity or making the page feel jumbled. Because it’s a paperback, it’s lightweight and perfect for little backpacks. 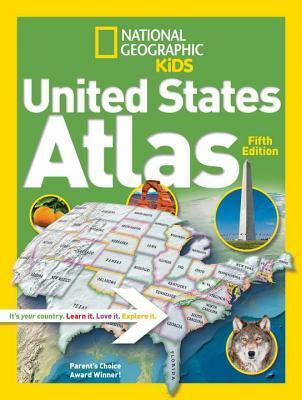 Now I want to get the World Atlas too!